PASCAGOULA, Miss., May 20, 2010 -- More than 100 Northrop Grumman (NYSE:NOC) employee volunteers supported the 2010 Special Olympics Mississippi (SOMS) Summer Games, held May 15 at Keesler Air Force Base in Biloxi, Miss. In addition to providing volunteer support, Northrop Grumman Shipbuilding-Gulf Coast Vice President and General Manager Irwin F. Edenzon presented a $5,000 check to the Special Olympics of Mississippi at the end of the event. The SOMS Summer Games featured more than a dozen events for Special Olympians, including track, golf, volleyball, tennis, sailing and high jump. Hundreds of Special Olympians and volunteers congregated in the Northrop Grumman-sponsored Olympic Village that offered games and prizes, food, drinks, fun and music. 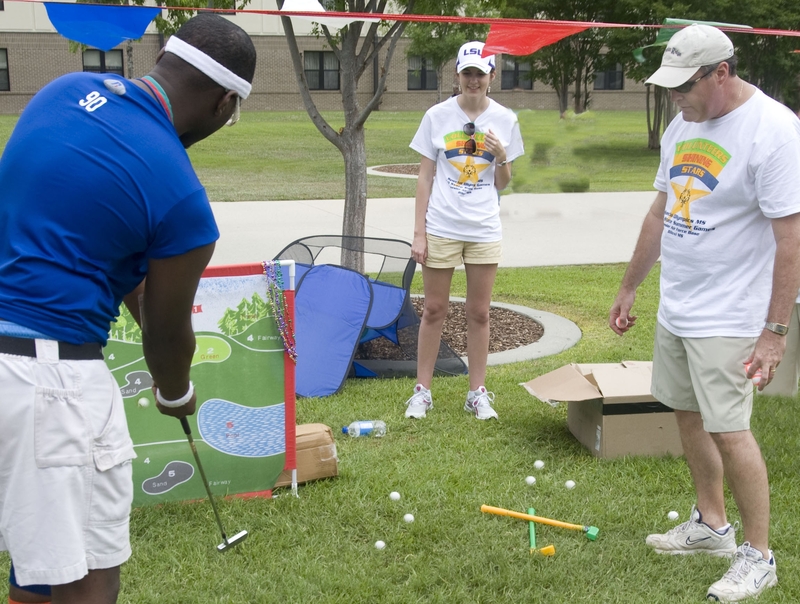 Gulf Coast volunteers staffed many of the booths in Olympic Village, including the water balloon toss, golf putt and milk bottle toss. Employees also handed out prizes, donated by hundreds of Northrop Grumman employees, to Special Olympians and their families. "The volunteers from Northrop Grumman -- more than 100 strong -- perfectly illustrate what these Olympics are all about," said Rodney McGilvary, a member of the Special Olympics Mississippi board of directors. "You all have seen it today and in past years. This check will go a long way to support these types of activities." Through year-round sports training and competitions, Special Olympics Mississippi empowers some 13,000 children and adults who have intellectual disabilities to participate in their communities and develop self-confidence. "The participation from Northrop Grumman shipbuilders extended beyond the event itself," said Kevin Amis, vice president of operations, for Northrop Grumman Shipbuilding-Gulf Coast. "Our shipbuilders designed and built the games and participated in a drive to collect thousands of stuffed animals used for prizes. Every smile you see is worth every drop of sweat out here." Many of the shipbuilders who volunteered for the event expressed their enthusiasm. "It's a wonderful thing to do, and I love to volunteer," said Doris Allen, welding instructor. "I'm at the age where my children are all grown and I like to give my time to something that's a very worthy cause." "I think this is a great thing the company is doing, so I just wanted to come out and help," said Greg Falls, pipe welding superintendent. "It's a great opportunity to help the community and help with these kids," said Steve Jones, general ship superintendent of LHA 6. "I just enjoy giving my time. It's something I can give back to the community." "The success of Special Olympics Mississippi is dependent upon people who are willing to give of themselves, individuals who participate not for personal gain, but for the well being of the community," said McGilvary.